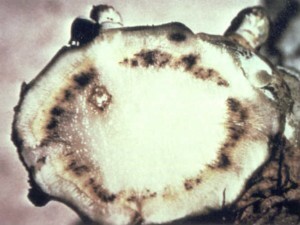 Black rot is one of the most destructive diseases of cruciferous plants worldwide. 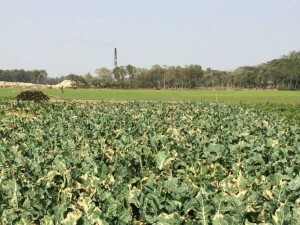 The causal agent is the bacterial pathogen Xanthomonas campestris pv. campestris. 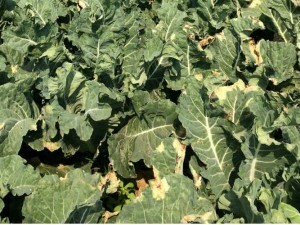 The disease affects primarily aboveground parts of plants at any stage of growth and causes high yield and quality losses. 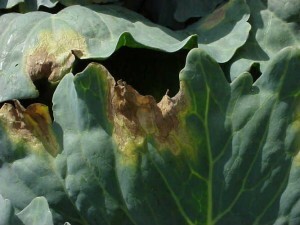 All vegetables in the crucifer family, including broccoli, Brussels sprouts, cabbage, cauliflower, Chinese cabbage, kale, mustard, radish, rutabaga, and turnip, are susceptible to black rot; however, symptoms of black rot vary according to age of host, host genus, species, and cultivar and even environmental conditions. 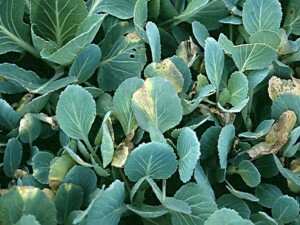 Some of the characteristic symptoms are the v-shaped lesions on the foliage and the discoloration of veins. 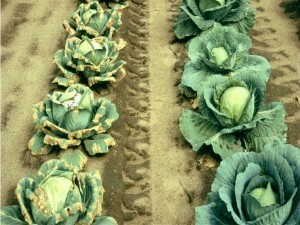 To manage this disease, implement sound sanitation practices, limit water splash, and plant clean seeds and transplants.